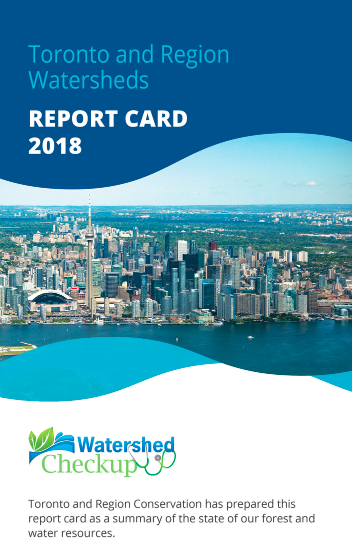 On March 22, World Water Day, the Toronto and Region Conservation Authority (TRCA) released the 2018 Toronto and Region Watershed Report Cards, a snapshot of the health of the area’s watersheds and waterfront. The report cards look at four indicators: groundwater quality, surface water quality, forest conditions, and land cover. Overall, the four indicators looked at have not changed much since the first report cards in 2013, which is good news considering the level of growth the region has seen. However, the watershed ecosystems remain under stress. Stormwater runoff is the main contributor to poor water quality, which, the report explains, is because it carries sediments and contaminants (like road salt) directly into streams. In addition, some important issues are rising that aren’t covered by the four current set of indicators. Particularly, chloride from road salt is increasing in streams and in Lake Ontario, even though some municipalities have been working to reduce the amount of road salt used for de-icing in winter. The TRCA found that about 60% of samples collected had a concentration of chloride greater than the federal guideline. Last month, a CBC article highlighted that these high levels of chloride in GTA waterways are damaging ecosystems, wildlife and ground water sources. This is also of great concern for farmers. Increased soil salinity (the concentration of dissolved salts in water) can greatly affect agricultural lands and operations, as it can impact plant growth and production. For more information on the area’s watersheds, we encourage you to view the report cards on the TRCA website. The 11 report cards take a look at Etobicoke Creek, Mimico Creek, Humber River, Don River, Highland Creek, Rouge River, Petticoat Creek, Duffins Creek, Carruthers Creek, the Lake Ontario waterfront, and one report card for the entire jurisdiction.